Castle Rising to North Wootton. I wonder how many were aware that Castle Rising used to have a horse-drawn railway? Castle Rising has not much top quality agricultural land because of its underlying geology. Much of the parish is located on Sandringham Sands, which look very like modern sand-dunes but were deposited more than 100 million years ago when dinosaurs roamed the area. This sand, along with sand from the Leziate area, is of high quality and has been used both locally and for export for glass making in the past. “xxid. given for carriage of sand towards the east gates.” . Older residents can remember that the sand-pits opposite the Golf Club were still in use after the second-world war, but the extensive beds of sand there are no longer exploited. I was alerted by John Smallwood of South Wootton, who had been told by Mr Towler a former resident of North Wootton that there used to be a horse-drawn railway or tramway which transported the sand from the Castle Rising for use elsewhere. 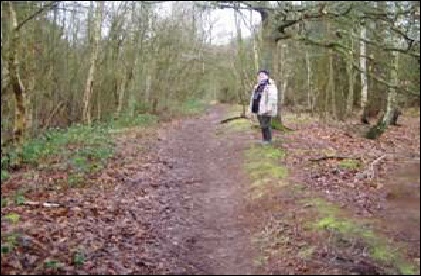 My wife Sylvia and I went in search of this trackway and were able to follow it for most of its route, running from the west end of the present sand-pits, through to and beyond the village of North Wootton and ending at Sheep Fold, a house on the road which leaves the village past the Red Cat . The trackway was probably built sometime in the 1820s or 1830s because it is penciled in on a map of the Manor printed in 1815 and preserved at the Norfolk Record Office*. It ended at the edge of the Wash (as it was then). Presumably the sand was then loaded onto boats and shipped. This arrangement must have been short-lived however because the Great Ouse was diverted at King’s Lynn in 1851 by an ambitious engineering project called the Marsh Cut which diverted the course of the Ouse a considerable distance to the west. This caused the Wash to retreat from North Wootton by more than a mile, producing in its place what is now fine agricultural land. A further obstruction to the Sand-pit railway occurred in 1862 when the King’s Lynn to Hunstanton Railway cut right across the sandpit railway just south of where the N. Wootton railway station is still located. There was no attempt to accommodate the sand-pit railway. I had assumed that this event, if not the earlier one of the Marsh Cut, had put an end to the sand-pit railway, so I was surprised to find a geological report of 1899 in which the author W Whitaker Browne says “This pit** was being largely worked at the time of my visit, the light coloured sand being carried along a tram-line to the railway station” (at N. Wootton). So it appears that although the King’s Lynn to Hunstanton Railway had blocked the transit of sand between the pit and the Wash, it had provided an alternative route for the export of the sand. If you are passing the area, why not look for the many signs of the sand-pit railway? As mentioned earlier the Sand-pit had been exploited since at least the early fourteenth century. But there is evidence of its use much earlier in the history of the village than this. Nineteenth century visits to the area by geologists indicate that the pits were also a main source of Silver Carr, a greyish sandstone material which is the major building material in the construction of both the Castle at Rising and the Church of St Lawrence in the village. Silver Carr is a type of sandstone produced within the beds of the Sandringham Sands. Large concretions of Silver Carr, around a metre in length and 20cm in width can still be found in sandy fields in the vicinity of Rising and Roydon and provide good building stone in a county, where such material is scarce. The Romans were aware of this building stone, quarried it in the Castle Rising area and in the third century AD transported it to their Fort of Branodunum near present-day Brancaster, and to another Roman site near Reedham, Norfolk. It would have been shipped down the Babingley River and transported around the coast. It seems likely that the Normans chose to build their castle at Rising, at least partly because of the proximity of the Pit and its Silver Carr. Silver Carr is also used in the building of one of the more elegant eighteenth century private homes in Castle Rising (Wakefield House) and also some of the nineteenth century houses in Hillington. *Although it could be considerably older if the original mapmaker had neglected to draw it in. **Opposite the present day Golf Club.